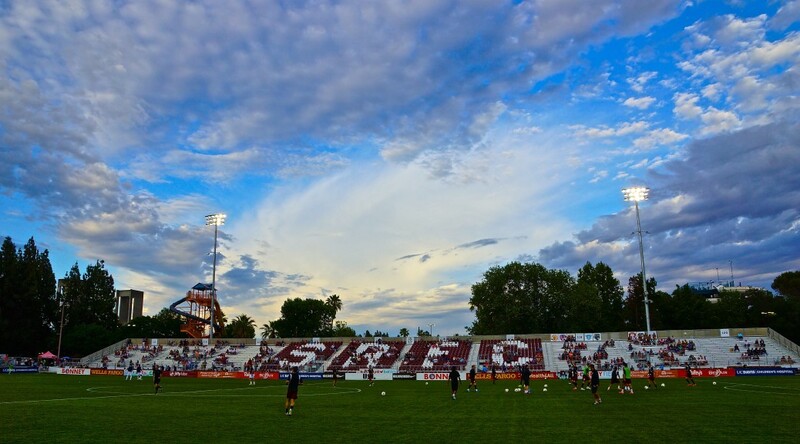 Sacramento Republic FC end their USL goalless and winless streaks as they come away with 3 points from a back and forth 3-2 victory over Tulsa Roughnecks FC at a sold-out Papa Murphy’s Park. The Roughnecks came out strong in the opening moments of the match as they pounced on their first chance in the 7th minute. Running onto a perfectly weighted through ball, Roughnecks captain Juan Pablo Caffa got behind the Republic defense on the left wing. Caffa drew Republic FC keeper Dominik Jakubek out just a step before sliding the ball across the face of goal to an unmarked Joey Calistri. The midfielder calmly slotted a one-touch left-footed strike past a slow recovering Republic FC defense and Jakubek for the early 1-0 lead. Republic FC equalized in the 29th minute in the form of a left-footed strike from captain Danny Barrera. The ball was played into the box and forward Sammy Ochoa was able to control it and lay it off for a charging Barrera. The midfielder took the chance in stride and beat Roughnecks keeper Fabián Cerda for the equalizer. Republic FC wasted no time in jumping ahead in the 31st minute when defender James Kiffe was able to find Ochoa on a near post run. The big forward used his size to seal off the defender as he sent the flick header past a diving Cerda for the 2-1 lead. The two goals in three minutes broke a streak of 592 minutes without a goal for Republic FC in USL play. The Roughnecks would find an equalizer of their own in the 67th minute. Republic FC defender Julius James was called for a handball in the box and Tulsa was awarded a penalty kick. The captain, Caffa, stepped up to the spot and coolly put his shot past a diving Jakubek who had guessed right. Republic FC would pull ahead again in the 77th minute, this time for good as Republic FC would score directly off of a Barrera corner kick. Barrera sent a left-footed, out-swinging corner into the box to find an aerial Chris Christian. The Republic FC defender skied over everyone and sent a powerful header on frame. The Roughnecks defense was able to get a deflection on the shot but it was too powerful and ended up in the back of the net, giving the home side a 3-2 victory and a much needed 3 points. Republic FC will hit the road again for a match against Seattle Sounders FC 2 on Sunday, May 28. Kickoff is 2 p.m. at Starfire Stadium. The match will be broadcast live on CW31.